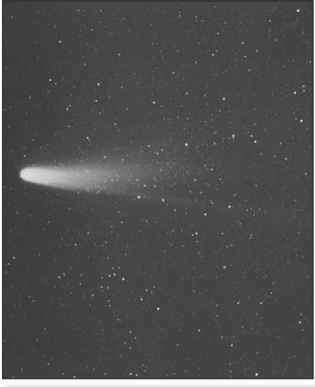 Halley's Comet was the first comet whose return was predicted and, almost three centuries later, the first to be photographed up close by spacecraft. In 1705 the English astronomer Edmond Halley published a work that included his calculations showing that comets observed in 1531, 1607, and 1682 were really one comet and predicting that comet's return in 1758. The comet was sighted late in 1758, passed perihelion (closest distance to the Sun) in March 1759, and was named in Halley's honour. Conquest of England (1066) and shown in the Bayeux Tapestry of that time. Its passage in 1301 appears to have inspired the form of the Star of Bethlehem that the Italian painter Giotto used in his "The Adoration of the Magi." Its passages have taken place about 76 years apart on average, but the gravitational influence of the planets on the comet's orbit have caused the orbital period to vary by a year or two from one reappearance to the next. During the comet's return in 1910, Earth probably passed through part of its tail, which was millions of kilometres in length, with no apparent effect. 2), and a European Space Agency spacecraft (Giotto). Close-up images of the comet's nucleus made by Giotto show an oblong object with dimensions of about 15 x 8 km (9 x 5 miles). Dust particles shed during the comet's slow disintegration over the millennia are distributed along its orbit. The passage of Earth through this debris stream every year is responsible for the Orionid and Eta Aquarid meteor showers in October and May, respectively. Halley's Comet is next expected to return to the inner solar system in 2061.